I've been spending quite a bit of my working hours in Long Branch these days, the western-most portion of Toronto along the lake. And even though I've been familiar with this area of the city for while, I keep discovering new little tid bits about this neighbourhood that makes Long Branch really grow on me. Not like a fungus or a bad rash, but like a new romance, maybe, that builds slowly. It's one of the few parts of the city where you can live near the lake without being a multi-millionaire, a place where you see one house with a stunning renovation next to a home that looks like some thing the Beverly Hillbillies lived in before they found the oil. You're surrounded by parks. The area along the lake is walker and dog heaven, as far as I'm concerned. The view of the industrial waterfront to the west is not the prettiest, but it only takes up a fraction of your view of the lake. What surprised me at a recent open house I had in Long Branch is just how many people want in to this neighbourhood. I see a lot of what I call downtown refugees, those folks who would rather have a small house or townhouse than a condo right downtown, but who still want to live in the city limits. It's like having the quieter elements of suburban life without technically leaving the city. Long Branch still has a way to go before it becomes great though. It used to have a lot of industrial buildings and zoning. Most of that is gone now, but there is a lot to be built. The townhouses that are being built are pretty nice and you often get better features than downtown at a lower price. The main strip of Lakeshore needs a lot more fresher businesses than what's currently there. Like the other Lakeshore communities to the east of Long Branch (namely Mimico and New Toronto), the main drag needs some love. But unlike those other two communities, the new condo developments seem to suit the scale of the neighbourhood. 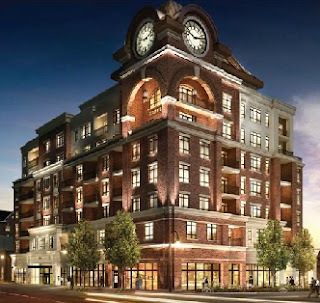 Watermark will be a new condo at Long Branch Ave and Lakeshore, and I think it will add quite a bit of character to the street. And it seems like the smaller townhouse-style development is what is going to continued for the most part in this area - Condos roughly 4 to 8 stories. I'm not sure how long Long Branch will take to fully transform into some thing revitalized and energetic. To many, it is just the end of the line for the Queen car. I think, though, that this place has some thing cooking.